An upgraded two-bedroom corner residence with two full baths, both with Jacuzzi tubs. 900 year old Austrian Larch hardwood floors, gas fireplace, walnut-stained wainscoting, new carpet, new paint and premium HDTV's with Blue Ray, Internet, Cable, and Streaming (Pandora, Hulu, Netflix, Amazon Prime and your personal accounts) home theater. FREE Wireless Internet. Semi private ski lift next door with ski-in/ski-out access. 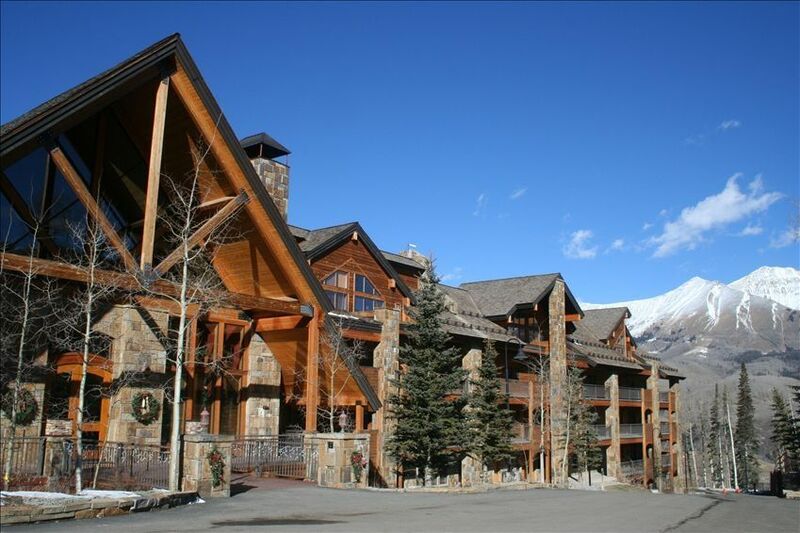 Large picture windows provide stunning views of the San Juan Mountains and most of Mountain Village. The best mountain views of any unit in the complex! PLEASE NOTE: Unlike many other properties, OUR condo does not have additional cleaning fees, resort fees, parking fees (1 vehicle), internet and phone fees, etc... this is all included in your rental. Many properties charge up to $100/day for these extras. The unit features a Master Bedroom with Luxurious Deep Pillow Top King Bed, a second Bedroom which can offer 2 twin beds or a King Conversion, and a double sofa sleeper with an exclusive 'Air Dream' mattress for a truly comfortable nights' sleep! The high-end kitchen features granite counter tops, stainless steel cookware and appliances and hand-painted ceramic dishware. And within walking distance of the unit, there is a incredibly well-appointed market and liquor store featuring local, organic produce and meats. Everything you need to prepare a gourmet meal is at hand. However, if you don't want to cook, the Bear Creek Lodge Concierge can arrange dinner reservations or a private chef. During the summer months, a bistro patio set is available right outside your door to enjoy the incredible scenery with someone special. No other unit offers this! The Lodge itself has a large, heated swimming pool, 3 hot tubs, a sauna, steam room and a comprehensive fitness center with cardio machines, resistance machines and free weights as well as on-site massage, ski valet, concierge, free shuttle bus, and complimentary wine and appetizers on select nights each week. There is also an optional, heated garage for your vehicle. And with the wonderful FREE Gondola into Telluride (voted the Best Commute in America! ), you may never need to take your car out at all while staying in beautiful Mountain Village. Highly functional and well-supplied kitchen. We like to cook; our unit reflects this. Ask at the front desk for movies to check out. We have a lovely balcony/patio right outside our front door--the other two bedroom units in the lodge do not have this feature. We have paired with a local vendor for guest discounts and in-unit delivery. Semi- Private Cross lift (tram which transports you to the ski slope), Steam room, on-site massage services available. The condo is fabulous. Comfy beds, good kitchen supplies, comfy furniture! The shuttle was never more than a few minute wait if that. The funicular is fun! Our party of three enjoyed our stay at this condo. It is very well appointed. The beds are super comfortable. The location can’t be beat. Highly recommend! Great quiet condo with great views and plenty of space for family of five. Used the free shuttle daily to and from main village area. We never waited more than 5 minutes for the shuttle. Everyone so friendly and helpful at the lodge. Beds where comfortable, even the pull out couch. Kitchen was well stocked. We always love to hear when guests enjoy our home as much as we do! Very clean and super nice. Great set up and awesome windows! We have stayed in the area many times and this is the best unit so far. We will be back to this exact unit in the future. Always nice to know what you are getting. The Bear Creek Lodge is at Mountain Village, right between the Market Gondola and to of the main Telluride Gondola. I was worried about the location ... that it might be too far from Mountains Village. It's not at all. It does sit near the convergence of several great hiking trails (and I believe it has easy ski access, though I was there in the summer). But, it's also an easy walk to the market or the main gondola to Telluride. Tonya's condo is also well situated on the lodge's first floor, which believe it or not, becomes a big plus to the altitude challenged. Tonya was very helpful dealing with VRBO snafus and so was the Bear Creek staff.